BOSTIC, N.C. (January 28, 2014): As New Yorkers fled from the devastation of Hurricane Sandy in 2012, the Defiant Whisky team from Bostic, N.C. rushed into the aftermath. Why? Because that&apos;s what they do. The same guys who distill what the Huffington Post declared "the only [whisky] we ever wanted to drink straight," are the same team from Defiant Marine, an international deep sea diving and ship salvage company. This crew of "salvage mercenaries" lived in a camper in Battery Park and spent 11 days piping water out of the NYC subway, helping to get it back up and operational. Switching from destruction to dapper, the divers are returning to New York this February with their debut product – Defiant Whisky – as the Official Whisky of Nolcha Fashion Week. In honor of their service after Hurricane Sandy, NYC Metro Transit Authority Superintendent David Bates presented the Defiant team with an original IRT (Inner-borough Rapid Transit) sign that now hangs inside Blue Ridge Distilling Company where Defiant Whisky is made. The whisky was almost a happy accident being the result of needing a hobby in between cleaning up global disasters. At only three years old, Blue Ridge Distilling Company may be a rookie on the whisky scene, but one taste of this smooth and remarkably refined spirit proves that it only belongs on the top shelf. Perhaps the real secret is the ingenuity behind the distillery&apos;s uniquely dynamic and cohesive team - one that can spend six days or six months sleeping head to foot submerged in a submarine and emerge still the best of comrades. It&apos;s this same bond of teamwork, intense drive, and laser-tight focus on perfection that is raising the bar for American whisky production and keeping Defiant in the limelight. Now for sale in 13 states and available online, the spirit was included in the 2014 Grammy gift bags. And if that isn&apos;t enough to rave about, Defiant is also the signature whisky of the upcoming documentary and television series Zero South, an expedition to the South Pole exclusively using batteries and biofuels. About Blue Ridge Distilling Co.
Blue Ridge Distilling Co. in Western North Carolina’s Golden Valley is the home of Defiant Whisky, a premium single-malt spirit prepared from only four of Mother Nature’s finest ingredients: first-rate American white oak toasted to perfection; specially cultured yeasted selected by owner Tim Ferris himself; two-row, premium brewer’s barley; and pristine water from beneath the Blue RidgeMountains. Visit your local spirit retailer to purchase your own bottle, or come by for a tour Monday – Friday between 8am – 4pm at 228 Redbud Lane in Bostic, N.C. Start with quality – end with quality. We are starting a whisky revolution. Join us. 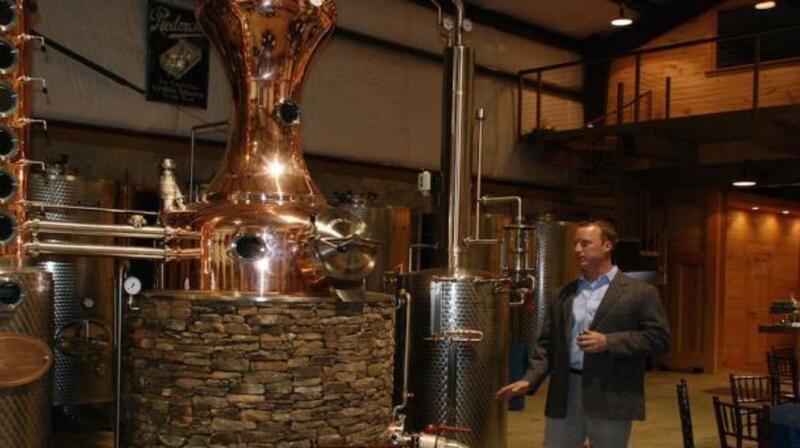 Learn more at www.defiantwhisky.com or contact us directly at 828-245-2041 or info@blueridgedistiling.com. From world-class adventure to breathtaking scenery, experience all things bold and beautiful in Lake Lure and the Blue Ridge Foothills of Rutherford County, N.C. Plan your trip today at www.RutherfordTourism.com or at www.facebook.com/LakeLureBRF.